Anaheim Ducks GM Bob Murray has been a busy man this season, orchestrating four of the past seven trades in the NHL and nine deals overall since the regular season began. Yet, as his team continues to dwell on the fringes of the Western Conference playoff picture, Murray is left to ponder other moves to either improve his roster or sell off what few valuable rental pieces he has. Outside of recent additions Michael Del Zotto and Derek Grant, who are unlikely to be flipped, the Ducks have only three other notable impending unrestricted free agents: forwards Jakob Silfverberg and Brian Gibbons and currently injured goaltender Ryan Miller. Many have speculated that Silfverberg could be the next player shipped out of town, but Murray was quick to state recently that he will continue to work toward an extension with the top-six winger instead. Until such time as the Club has or makes Payroll Room in the current year in excess of such Tagged Payroll Room, the Club may not engage in any Player transactions requiring Payroll Room, including but not limited to, acquiring an SPC or “extending” or entering into a new SPC. In layman’s terms, this simply means that teams are not permitted to acquire players with non-expiring contracts or agree to new contracts with current players that would put a future season’s payroll above the existing salary cap. Although the current salary cap ceiling of $79.5MM is almost guaranteed to increase next season, perhaps even substantially, and even though cap hits toll as the season progresses, allowing teams to acquire players they otherwise could not have afforded earlier in the year, they still may not surpass the current cap limit when it comes to the future. For the Ducks, this rule is especially topical. Anaheim has 16 non-waiver exempt players under contract next season at a total of $70.4MM, the most committed salary of any team in the league. Projecting their 23-man roster payroll for next season easily exceeds $74MM. Even after cutting future salary in the Andrew Cogliano–Drew Shore swap, the Ducks have little room to maneuver while avoiding a “tagging” problem. Without moving out another long-term player, Anaheim would likely struggle to extend Silfverberg in the current league year to a salary exceeding $5-6MM. Given that Silfverberg is currently underpaid at just a $3.75MM AAV, the proven two-way forward is very likely to land in that range. Similarly, the Ducks would be hard-pressed to add a player with term remaining at a cap hit in or above that range. Even if they did find a way to make one of those moves or the other, it would severely limit their roster flexibility the rest of the way this season. The question thus becomes, if extending Silfverberg in the current season is not a viable option, should the team consider moving him? Even if they have an oral agreement with Silfverberg to sign a new contract this off-season, they cannot truly know that he is committed to staying in Anaheim until pen meets paper. The Ducks could easily fall out of the playoff race following the trade deadline and Silfverberg could decide he would rather test the market. Meanwhile, the team should be able to recoup some nice trade capital if they did decide to trade Silfverberg and could always re-sign him this summer. Even though Murray seems intent on keeping Silfverberg around, the looming shadow of the “tagging” rule makes it a much tougher situation. If you like to see the best teams in the NHL face off, you’ve arrived at the right day on the schedule as several matchups this evening will be star-studded. The Vegas Golden Knights and Winnipeg Jets clash in a battle of 60-point Western Conference teams, while the Washington Capitals and Pittsburgh Penguins hit the road to face the Nashville Predators and San Jose Sharks respectively. While those teams prepare for war, we’ll be right here keeping track of all the minor moves. With Andrew Cogliano expected to make his Dallas Stars debut tonight, the team has sent Michael Mersch back to the minor leagues. Mersch was only recalled yesterday, likely as insurance should Cogliano have faced any difficulties getting situated with his new club. Joseph Gambardella has been sent to the minor leagues by the Edmonton Oilers in order to make room for the newly acquired Colby Cave. Cave is expected to immediately enter the lineup, while Gambardella will have to return to the Bakersfield Condors for the time being. Meanwhile in Boston, the Bruins have recalled Peter Cehlarik to replace Cave’s roster spot. Cehlarik has 29 points in 37 games for the Providence Bruins and will try to establish himself at the NHL level given the team’s bottom-six needs. Dylan Gambrell is on his way back to the San Jose Sharks after dominating at the minor league level. With 24 points in 27 games, Gambrell is showing exactly why he was selected in the second round and found so much success at the University of Denver. The Anaheim Ducks have decided it’s time to shake things up, trading iron man Andrew Cogliano to the Dallas Stars in exchange for Devin Shore. The deal includes no other assets or retained salary. It’s not surprising that the Ducks’ front office has decided something needed to change, given the 11-game losing streak they are currently experiencing. Anaheim was once safely in the playoff picture in the Western Conference, but have plummeted down out of the race in the Pacific Division and find themselves grasping for anything to keep them afloat. Whether this is the first move in a fire sale or just one to try and spark some offense isn’t clear, but they’ll head into the second half of the season with a new face on the ice. Not only do the Ducks get younger in this transaction, but they’ll also add some extra depth down the middle with the 24-year old Shore. With 17 points this season he’s on pace for basically the exact same offensive season he’s had the past two years when he recorded 33 and 32 points for the Stars. It’s hard to imagine there is a lot more upside there, but perhaps a fresh start in Anaheim will spark the second-round pick. He hasn’t played center regularly since 2017, but could potentially see time there on an Anaheim team that has struggled to stay healthy down the middle. In acquiring Andrew, we are able to add a conscientious player who brings a veteran-presence to our room. His explosive speed, 200-foot game and iron-man mentality will help our team both on and off the ice. That mentality helped Cogliano reach the fourth-longest games played streak in NHL history earlier in his career when he suited up for 830 consecutive games. A suspension broke that streak, leaving him still without a single game missed due to injury in his 12-year career. There’s no doubt that Cogliano will be able to add some consistency to the Dallas lineup, but there is also no shortage of risk in a deal of this nature. While Shore is under contract for one season after this one at a cap hit of $2.3MM before becoming a restricted free agent, Cogliano is still working on a deal that extends through 2020-21. That contract was signed almost exactly a year ago, and carries a $3.25MM cap hit. The Stars have plenty of cap room going forward after Jason Spezza’s deal expires at the end of the year, but if Cogliano can’t turn things around and contribute at least a little bit offensively he could represent a quite overpaid asset. His 11 points puts him on pace for the worst season of his entire career. Overall, this is a swap between two teams looking for answers. Neither has lived up to the lofty expectations many placed on them, and though Shore and Cogliano are not game-changing talents, a fresh start could invigorate both. It will be interesting to see if the Stars get Cogliano up to speed quickly enough for him to appear in tomorrow’s game, and not risk missing just the third contest of his career. The Vancouver Canucks have had an interesting start to the year, with impressive performances from rookie Elias Pettersson but bad losses at the hands of the Calgary Flames and Carolina Hurricanes. The team has allowed 14 goals in three games, and is busy shaking up their blue line to try to find answers. One player that won’t be taken out of the lineup because of his play is Alexander Edler, but there might be a break-up coming down the line anyway. Edler is scheduled to become an unrestricted free agent at season’s end, but has made it clear he wants to spend the rest of his career in Vancouver. Still, as Elliotte Friedman of Sportsnet points out in his latest 31 Thoughts column, Edler would be an attractive rental piece at the trade deadline for a contender. The 32-year old defenseman is averaging more than 25 minutes of ice time through the first three games and is coming off his most effective offensive season in some time. Friedman notes that the Tampa Bay Lightning has shown interest in the left-hander before, and that “someone” will again even if he’s determined to return to the Canucks in 2019-20. The Montreal Canadiens will face a tough decision in the coming days, as Eric Engels of Sportsnet writes that the team will likely put either Jacob de La Rose or Nikita Scherbak on waivers once the former is back to full health. Both high draft selections, neither player has really found much consistency in the NHL and even their youth can’t get them into the current lineup. Engels believes that both would be prime targets for a waiver claim, given that they still hold some substantial potential. There are obviously other ways out of the roster crunch, but if it does come down to a waiver placement and attempted minor league assignment, the Canadiens could find themselves losing some of their forward depth for nothing in the coming days. Ryan Kesler was on the ice at the Anaheim Ducks morning skate, and even took line rushes between Andrew Cogliano and Kiefer Sherwood according to Josh Cooper of The Athletic. The veteran forward was not expected to return so soon, and head coach Randy Carlyle wouldn’t even confirm that he’ll be in the lineup tonight against the Arizona Coyotes. If he is back to health it’s at the perfect time as the Ducks are without Ryan Getzlaf and are struggling to find much offense up front. An expected Stanley Cup contender, the Ducks have been ravaged by injuries early and could use some good news on that front. The NHL has handed out the Three Stars of the Week for the first time this season, naming Auston Matthews as the top performer through the first few games. Matthews leads the NHL with eight points through three games including five goals, and has been a huge part of the Toronto Maple Leafs getting off to a 2-1 start. The Maple Leafs have looked shaky in their own end to start the year, but with the firepower that Matthews and John Tavares can provide up front it might not matter on most nights. Jonathan Toews and Ben Bishop were named to the other two spots, noting a bounce back for both players this season. Toews especially had a down year as the Chicago Blackhawks disappointed in 2017-18, but is off to a blistering start with five goals in his first seven periods and six points total through three games. If the Blackhawks are to return to relevancy this year, they’ll need their captain to be among the best players in the league once again. Speaking of captains not living up to expectations, the Anaheim Ducks were without Ryan Getzlaf today at practice while he deals with a lower-body injury. That meant first-round pick Isac Lundestrom was skating between Andrew Cogliano and Kiefer Sherwood according to Eric Stephens of The Athletic, giving the young forward a chance to make his NHL debut later tonight. Lundestrom has been surprisingly polished through training camp, and even at the age of 18 looks like a possible contributor for the Ducks this season. The 23rd-overall pick scored 15 points in 42 games in the Swedish Hockey League last season, and will try to make an even bigger impact in the NHL. The Ducks aren’t the only one with an impressive young prospect though, as Buffalo Sabres draft pick Ukko-Pekka Luukkonen has won the OHL Player of the Week award. Luukkonen is playing for the Sudbury Wolves this season as he prepares for life as a professional in North America, and is already 5-0 with a .944 save percentage. Selected 54th overall in 2017, Luukkonen signed his entry-level contract this offseason and is quickly becoming one of the top goaltending prospects in the league. He’ll likely start out next season in the AHL, but the Sabres are hoping for big things from him down the line. In addition to the lateness of the hit, what elevates this check to merit supplemental discipline is the substantial head contact and significant force. This is a late, high, forceful check on a player who is not eligible to be checked in any manner. Cogliano has never been fined or suspended in a career that spans more than a decade. That career has also not been marred by a single injury or healthy scratch, as the 30-year old hasn’t missed a single game since he entered the league. That streak of 830 games ranks fourth all-time in NHL history, but will come to an end midway through his 11th season. Keith Yandle will now become the active consecutive games played leader with 676. While the streak ending is disappointing for the sake of history, losing Cogliano for a pair of games will have a big impact on the Ducks. As shown by his recent three-year extension, the team knows the important role that he plays for their team as a player who can be relied on defensively and on the penalty kill. With the Ducks trying their best to crawl back into a playoff spot, they claimed J.T. Brown off waivers earlier today, perhaps expecting a suspension coming down from the league. They take on the Colorado Avalanche tomorrow afternoon, in a game between two Western Conference teams tied in the standings with 49 points. The Department of Player Safety announced they will have a hearing today for Anaheim Ducks forward Andrew Cogliano for his illegal check to the head on Los Angeles Kings forward Adrian Kempe during the first period of Saturday night’s game between the two teams. A possible suspension for the iron man Cogliano in jeopardy. The veteran has not missed a game since 2007 and has played 830 consecutive games, ranking fourth highest in NHL history, according to NHL.com’s Tom Gulitti. Elliotte Friedman added that he is just 134 games behind Doug Jarvis, who played with Montreal, Washington and Hartford between 1975 to 1988. On his Headlines segment on Hockey Night in Canada, Friedman reports the San Jose Sharks are trying to trade defenseman Paul Martin. The veteran defenseman, in his third season with San Jose, was injured in the second game of the season and has only appeared in one game since then on Dec. 7. He played a four-game stretch of games in the AHL on a conditioning loan, but has been called up and has been a healthy scratch since. With the emergence of defensemen Tim Heed and Joakim Ryan on San Jose’s blueline, there is no place for Martin. With defenseman Dylan DeMelo about ready to be activated off of injured reserve, the team hopes to send Martin elsewhere. Martin played 159 games in his first two seasons with the Sharks. The problem is Martin is owed $4.85MM both this year and next, which might make moving the veteran much more difficult than it looks. Paul Gackle of the Mercury News writes that while the Sharks are likely to move goaltender Aaron Dell before he hits unrestricted free agency this summer, the team cannot consider moving their backup goaltender until the last possible moment as the team finds itself fighting for a playoff spot. The Sharks are currently one point out of a playoff spot in a highly competitive race. “We need great goaltending in the second half,” head coach Peter DeBoer said. Due to the recent struggles of starter Martin Jones, the team doesn’t want to lose Dell too quickly in case Martin, who has struggled since the beginning of December, fails to bounce back. Gackle adds that in a perfect world, the team would try to send Dell off as soon as possible to get a fourth-line center or a wing. The Las Vegas Review-Journal’s Steve Carp writes the Vegas Golden Knights avoided a possible injury Saturday in their game against Edmonton when forward Pierre-Eduoard Bellemare took a puck to the face off a shot from defenseman Darnell Nurse. The veteran tough-guy took three stitches and only missed one shift. 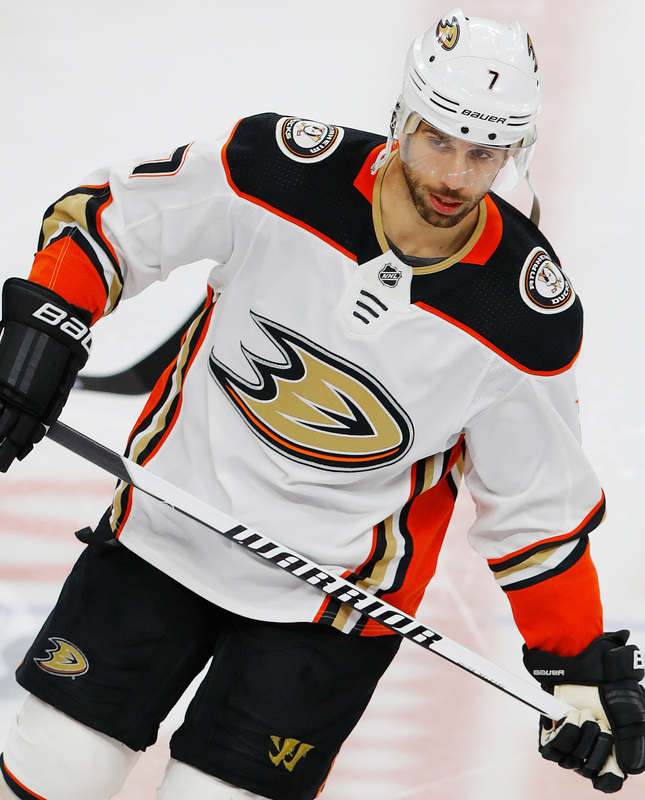 The Anaheim Ducks have locked up one of their key contributors, signing Andrew Cogliano to a three-year extension through the 2020-21 season at an annual average salary of $3.25MM. Cogliano has suited up for all 43 games for the Ducks this season, extending his incredible streak to 829 games (his entire career in fact) without missing a single contest. The deal includes no signing bonuses, and gives him both no-trade protection for the rest of this season and a partial no-trade clause for the next three years. Cogliano, 30, was scheduled to become an unrestricted free agent this summer and could have been a much sought-after player. Though his offensive upside is somewhat limited, he’s shown an ability to move up and down a lineup and has long been one of the top penalty killers in the league. Since entering the league in 2007-08, he ranks seventh in the league in shorthanded goals with 17. With the injuries to several key forwards for the Ducks this year, he’s actually recorded the second highest average time on ice of his career, and the most since coming over to Anaheim from the Edmonton Oilers in 2011. Limited to just five goals this season, there is reason to believe that he’s been more unlucky than ever. His shooting percentage is at a career-low of 5.3%, despite him being on pace to record the second most shots on goal of his career. While no one will crown him a 30-goal player, an expectation of 12-18 goals and 30-35 points is still realistic going forward. Whether his body will eventually betray him is still to be seen, but you can’t get a more consistent player to invest in. For the Ducks, a $3.25MM cap hit is more than palatable. Cogliano was already earning $3MM this season, and with Kevin Bieksa’s contract coming off the books at the end of the season there is more than enough to go around. While the team does need to extend Nick Ritchie and Ondrej Kase, neither should demand a prohibitive cap hit going forward. Brandon Montour will need a new deal, but after just 68 career games so far he certainly could be signed on a smaller bridge deal. Any problems, if they are to come, would be the summer of 2019 when the Ducks are scheduled to have Jakob Silfverberg (UFA), Adam Henrique (UFA) and John Gibson (RFA) all hitting free agency at the same time. With Corey Perry, Ryan Getzlaf, Ryan Kesler, Patrick Eaves and now Cogliano all in their thirties and signed through at least the 2019-20 season, things might get dicey when trying to fill out the rest of the roster. Still, with the salary cap going up and Eaves’ unclear future coming back from Guillain-Barre Syndrome , Cogliano’s contract was almost must-sign for the club. He may have been able to fetch even more on the open market if a few bounces go his way in the second half, and his impact would have been difficult to replace internally. With the 2018 free agent class getting thinner with every extension, it will be interesting to see where the rental market finally lands at the end of next month. Pierre LeBrun of The Athletic was first with the details of the contract, including salary breakdown and trade protection. Oilers defenseman Andrej Sekera skated for the first time on Friday since undergoing surgery to repair a torn ACL sustained late in May during the playoffs, notes Postmedia’s Jim Matheson. The blueliner says that his recovery is on schedule but given the varying timelines for players coming back from this surgery, there remains no firm timeframe for his return. At the time of the operation, the team said he’d be out between six and nine months; the six-month mark is still a couple of weeks away (November 18th). Sekera estimates that he won’t be cleared for contact for another two weeks so it’s unlikely that he will get the green light to return until late this month at the earliest. The Canucks announced the recall of goaltender Thatcher Demko from Utica of the AHL. This will be his second stint with the team so far this season although he did not get into a game when he was up last month. He will be on standby to take the place of Anders Nilsson whose wife is set to give birth shortly. The 21-year-old Demko is off to a strong start in the minors this season with a 1.85 GAA and a .939 SV% through seven AHL appearances this season; those numbers rank fourth and second respectively league-wide among qualifying netminders. Ducks winger Andrew Cogliano is set to become only the fourth player in NHL history to play in 800 straight games when he suits up tonight against San Jose, notes Eric Stephens of the Orange County Register. He will become only the second player to do so in the first 800 games of his career. The record is held by Doug Jarvis at 964, meaning that if he can stay healthy, Cogliano should have a chance at beating the record in a couple of years. Not only led all defenseman in scoring with 76 points, but finished ninth overall among some of the league’s most dynamic forwards. Can check with the best of them as well. Bergeron has won three of the past four Selke’s and hasn’t finished outside the top five in voting since 2008. He also led the league in face-off wins, winning over 60% at the dot, and trailed only McDavid in Expected +/-. Care to bet against him?